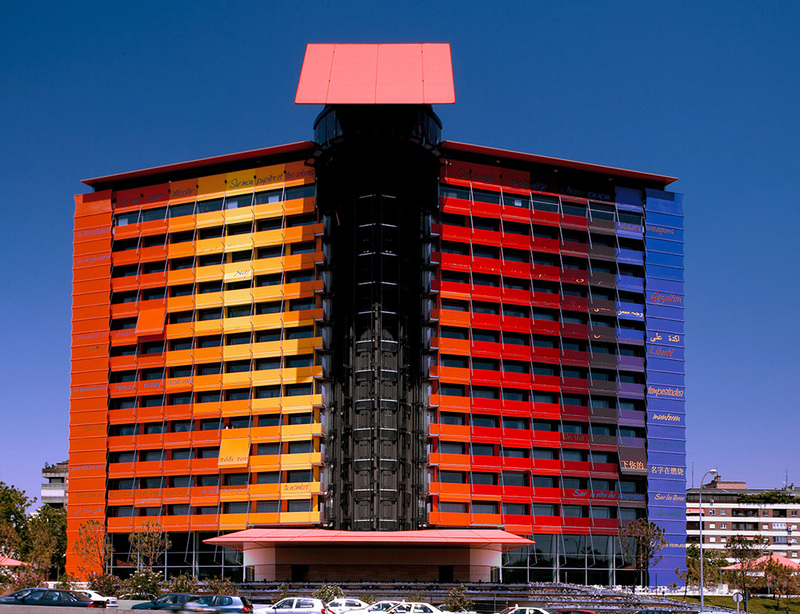 Unlike the most luxurious hotels, Hotel Puerta Am?rica is located far from the centre of Madrid and its sights, but since the opening in 2005 it has been acting as a magnet for tourists from all over the world. The hotel has 342 rooms, comprising of 308 premium rooms, 22 junior suites (larger than the premium rooms) and 12 suites which are located on the top floor. 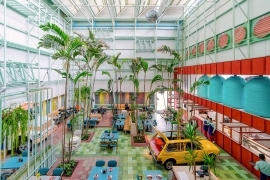 Nineteen world-famous architecture and design studios have been involved to design one of the twelve floors of the hotel (including lobby, hallway and rooms), entrance hall, restaurant, cocktail bar and underground car parking. 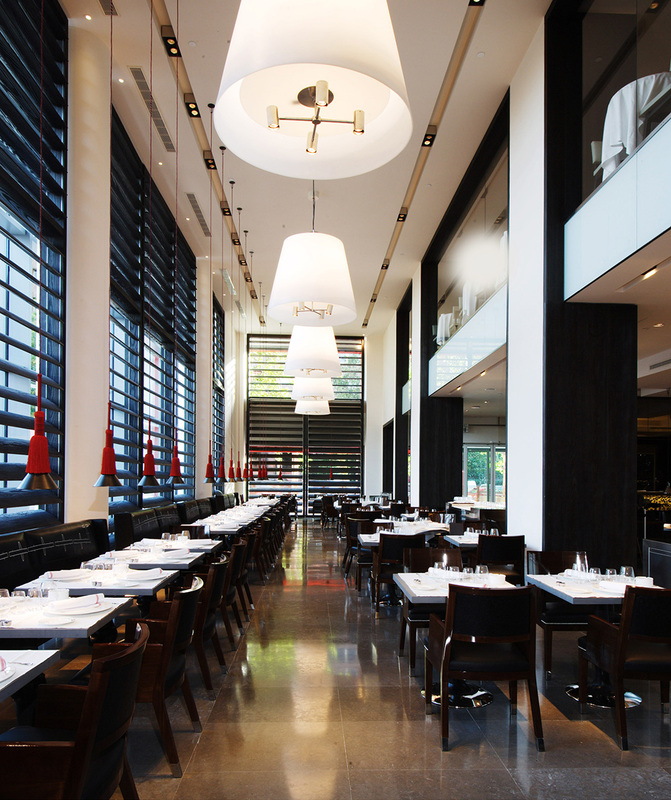 The brief – to create a perfect hotel space as everyone of them considers it. Moreover, relying on author’s professionalism, the client didn’t want to limit their imagination technically or financially (the final budget was approximately 75 million euros) and allowed them full autonomy. 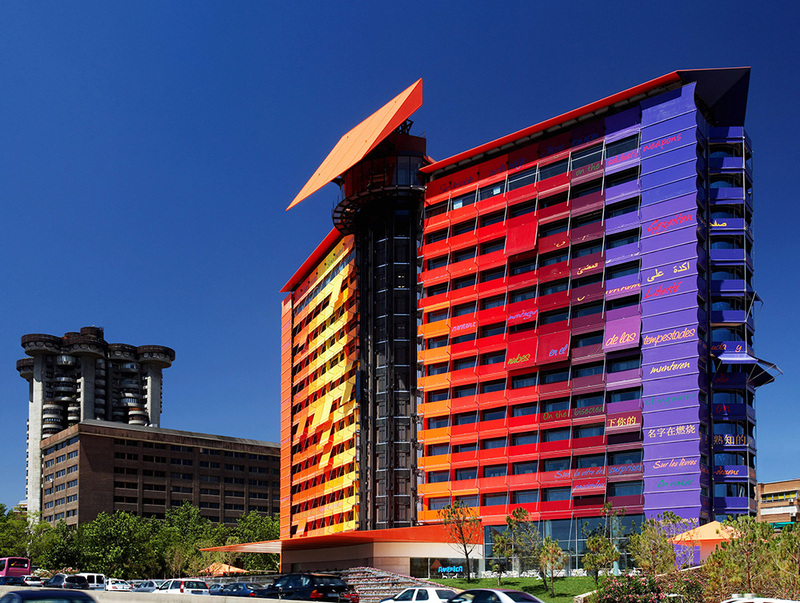 The fa?ade of the hotel has been designed by a French architect Jean Nouvel, who has also designed the twelfth floor and the penthouse. 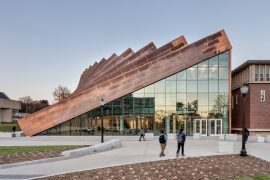 In spite of the fact that the form of the building is quite simple, it looks vivid and impressive with over 500 awnings in 14 different colours. 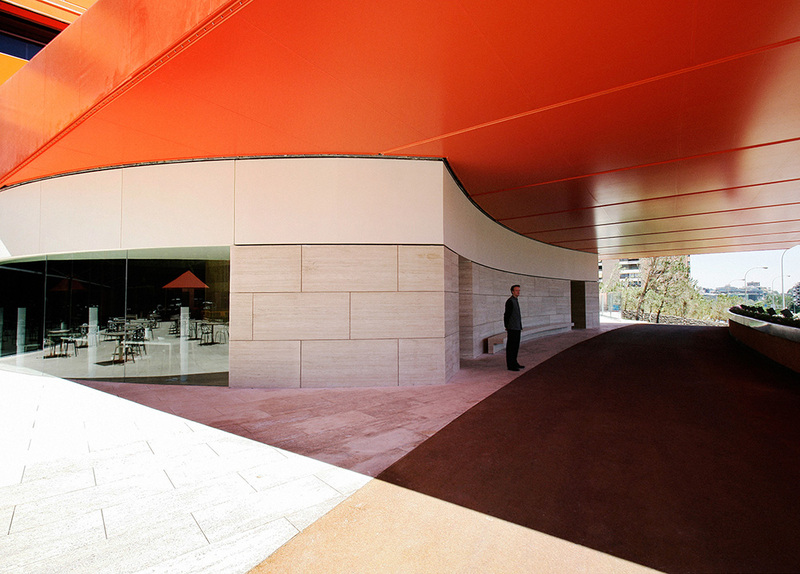 The front of the building uses warm tones of orange and red, the reverse side strong blues. To emphasize the idea of freedom it was decorated with extracts from the poem Libert? by French lyricist Paul ?luard, which were written in different languages. Car park. Stimulus of colours. Teresa Sapey. Not only does the poem Libert? 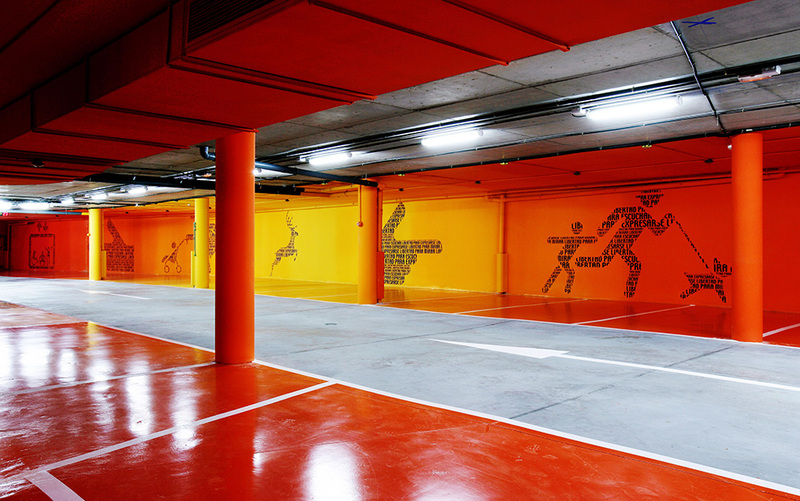 take up the entire fa?ade, but it was also a great source of inspiration for Italian architect Teresa Sapey, who designed a two-story underground car park. 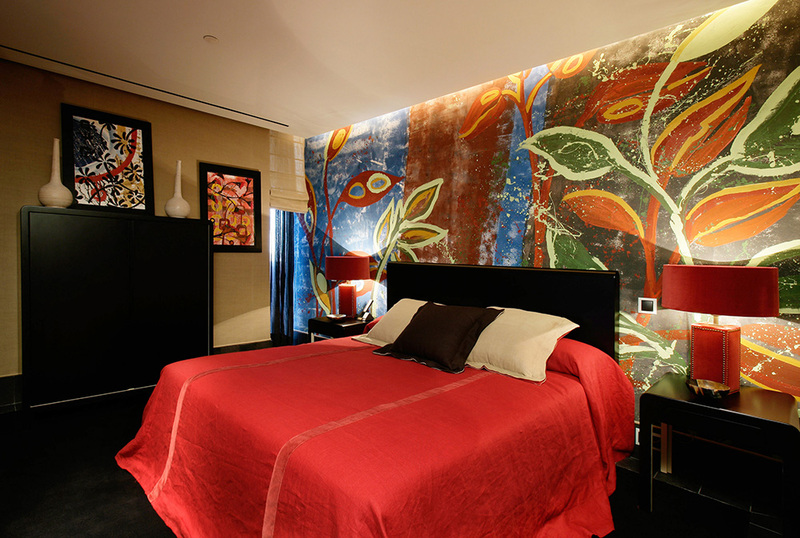 Her idea, based on graphics and colour, was to add emotions in a space that is usually considered as dark and boring. 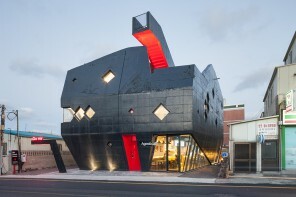 The architect picked a number of words from the poem and rendered graphic symbols by mixing them. 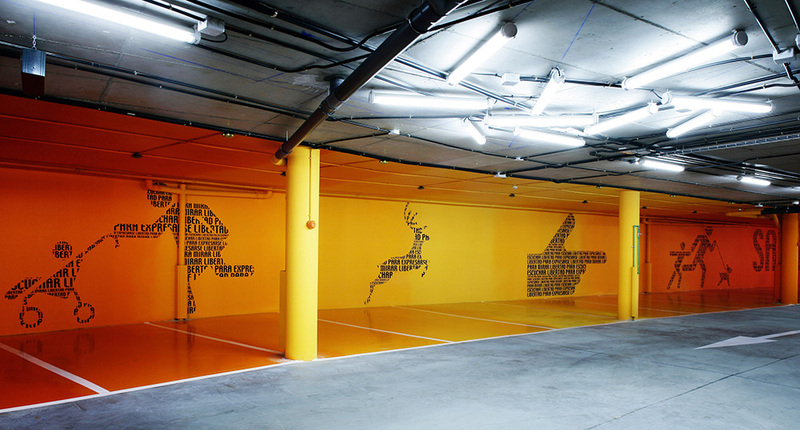 Being imprinted on the bright and colour-saturated walls, these symbols lead guests through the garage and refer them to the idea of freedom which Puerta Am?rica is based on. 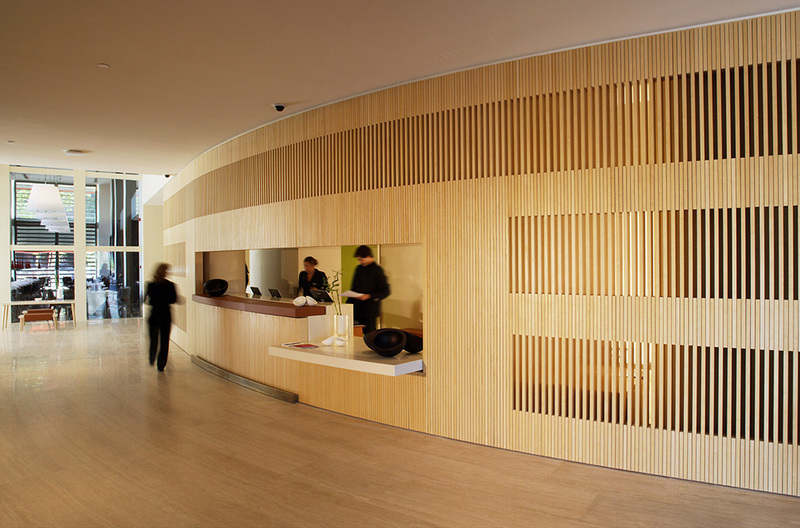 Reception desk and meeting rooms. John Pawson. 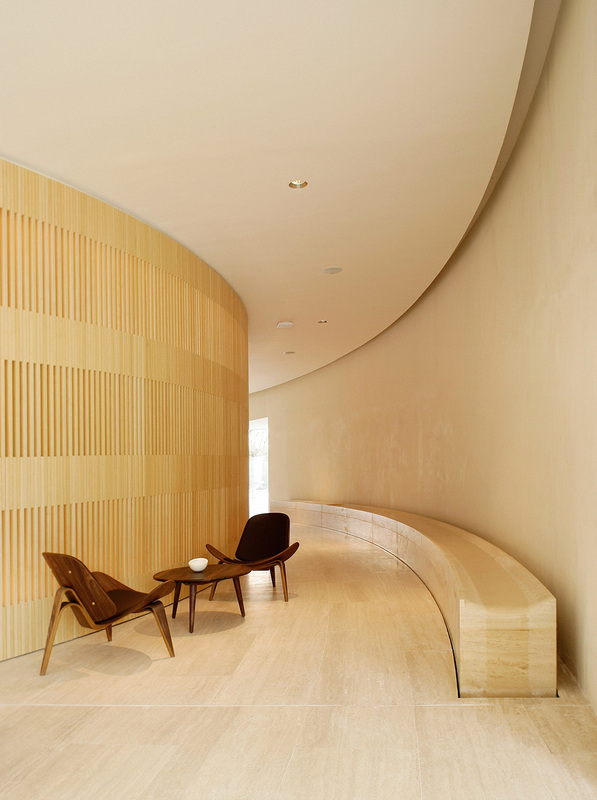 Pawson says that he wanted to create ‘a space of peace and quiet in the heart of the hotel’. He considers a usual foyer in a hotel as a place it is difficult to spend much time in. 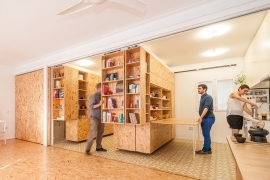 But Pawson’s project is an example of a different concept of foyer: a reception space but at the same time a space where guests can relax, have a coffee, read a newspaper or hold a pleasant conversation. He created an atmosphere that makes people feel really comfortable. Restaurant. Latin inspiration. Christian Liaigre. At the entrance of the hotel, on the left, there is a restaurant, called L?grimas Negras. 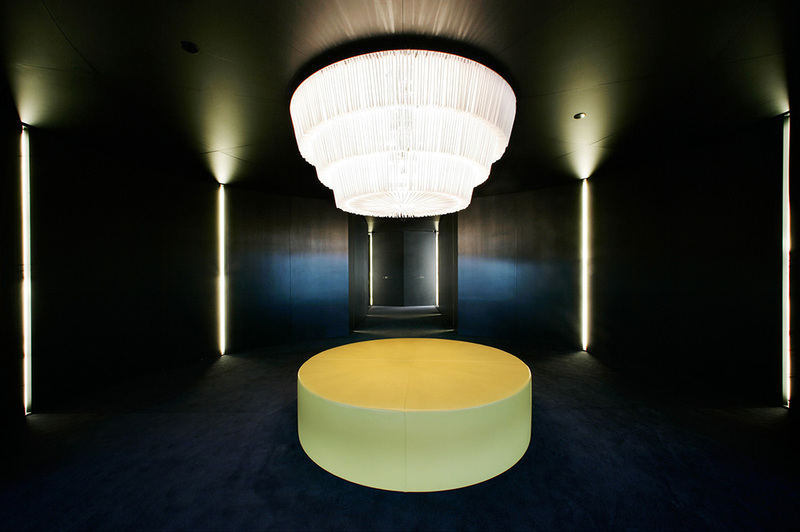 The project has been made by Christian Liaigre, one of the leading French fashion and interior designers. The entire space has three areas: a restaurant, a lounge bar, where you can have a drink between mealtimes, and a buffet in the upper part. 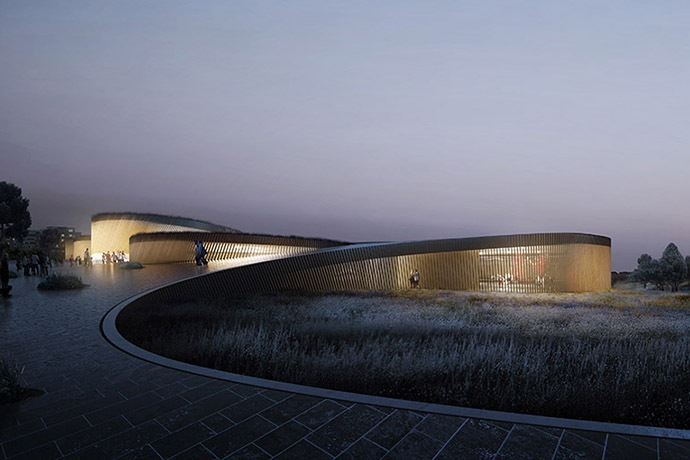 For this project, he was inspired by his own particular vision of Madrid, which he considers as a heterogeneous city. He integrated different graphic hallmarks from several Spanish regions, including Andalusia, Catalonia and Galicia: ceramics, arabesques in forged iron, embroidery. Wanted the restaurant space to be cosy and comfortable, Liaigre used natural and luxurious materials for decoration, like leather, wood and stone. Bar counter is made of LG Hi-Macs and decorated with abstract motifs. 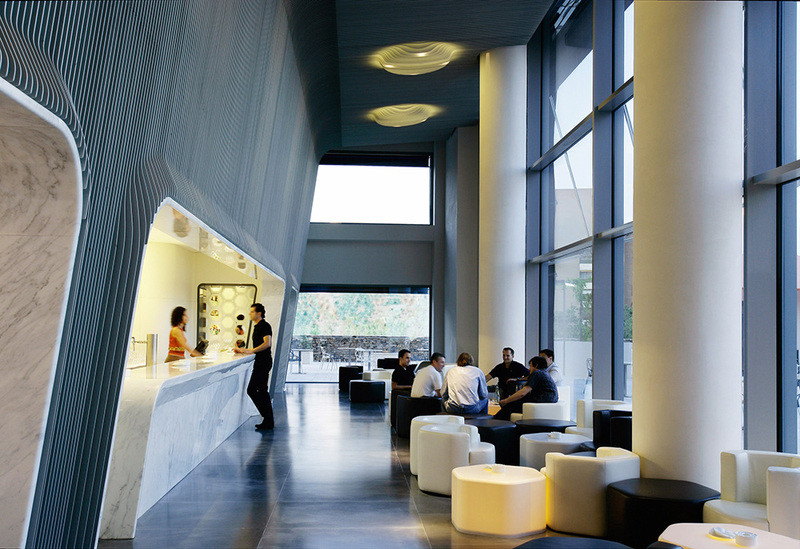 The first impression of MARMO BAR is formed by is its height, enhanced by 400 almost seven metres tall aluminium beams, with a five-centimetre gap between them. They are arranged to form a vertical line that magnifies the length of the bar, as well as its depth and rhythm. The bar is a single 8.25 metre long unit made of white Statuario Venato marble from the Carrara quarries, the original piece weigh about six tonnes. On either side there are two openings with white leather seats for clients desiring more tranquil or private atmosphere. Hexagon tables are covered with leather and illuminated from within. 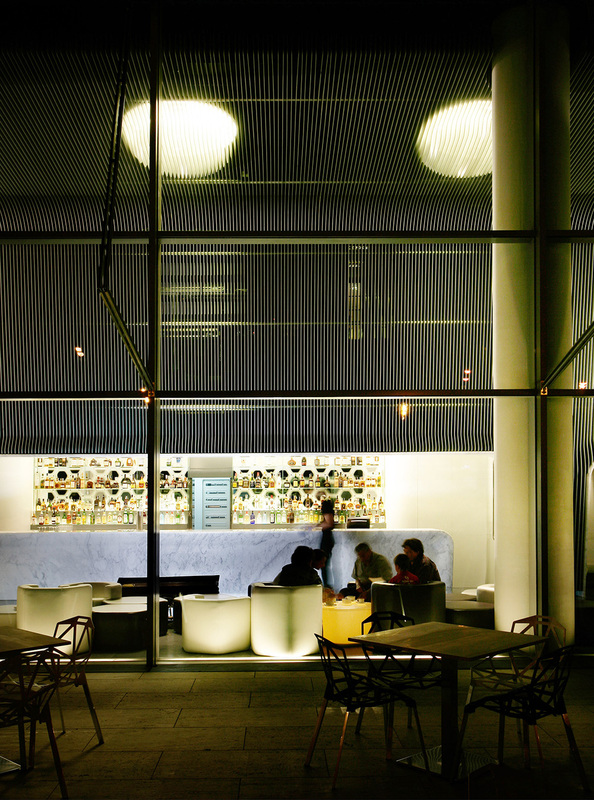 The wall leading to the outdoor terrace is made entirely of glass, so you can see what is happening outside from inside of the bar. First floor. Sinuous lines, fluid spaces. Zaha Hadid. 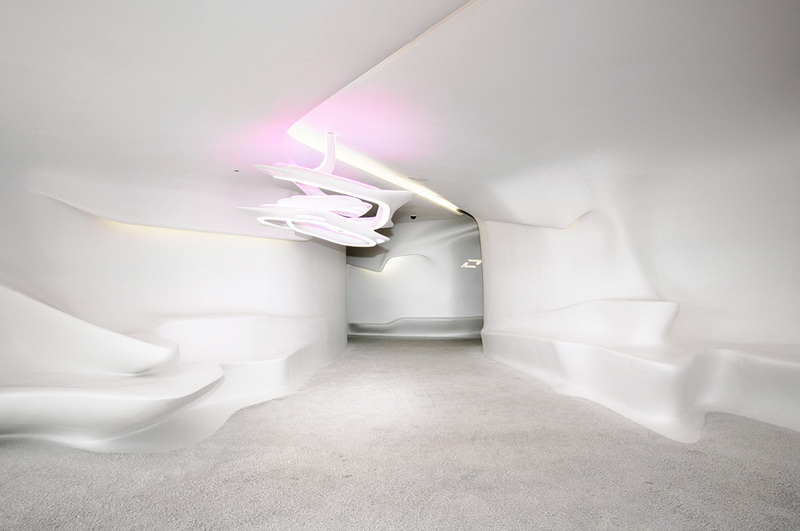 Space of the first floor is characterised by sinuous, flowing shapes. The most noticeable element in the lobby is the lamp, christened with the name Vortexx. It is truly spectacular and is placed at eye level so that all the changes can be appreciated. The light seems almost like a liquid within the twisted shapes of this lamp. 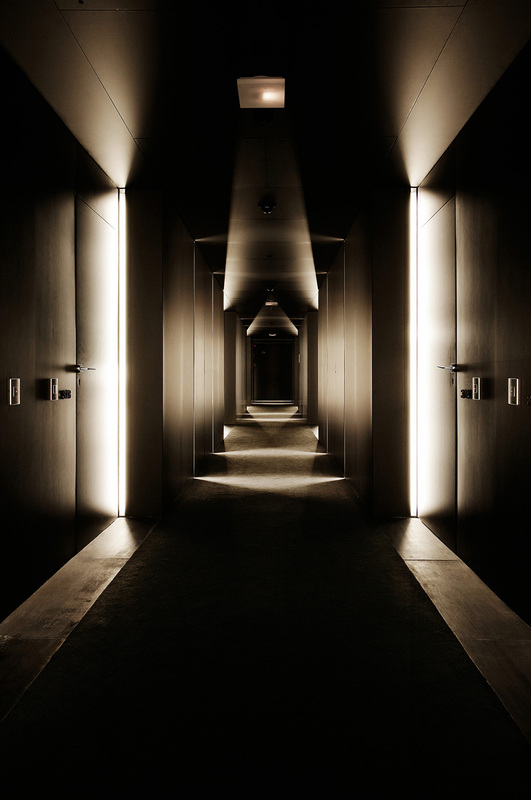 In the hallways, one of the most noteworthy elements is the lighting created for the doors. This entails a strip of LEDs that illuminate the messages on the doors. In this way, from the inside guests can indicate whether they want breakfast to be served, the room to be tidied, not to be bothered, or any repair to be made. Everything in the rooms seems to ‘grow’ out from the walls. 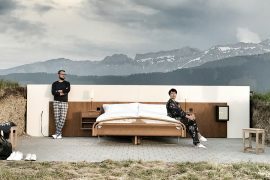 Every single element – the walls, bedroom door with its LED signs, sliding door to the bathroom, bathtub and vanity unit, bed, shelves, chair and a cantilevered bench by the window which doubles up as a table – is rounded in a single curved sweep. Second floor. Elegance and flexibility. Norman Foster. As Foster claims, he has created a ‘perfect urban sanctuary’. His vision was inspired by the palette of materials of the Basque sculptor, Eduardo Chillida, a personal friend. Chillida explores natural materials and organic forms, which were reinterpreted in the Foster’s project to create a design concept based on simplicity, function and luxury. Chillida’s treatment of space as a material to mould, and the interplay between positive and negative space, has been echoed in the sculptural quality of the hotel rooms and corridors. 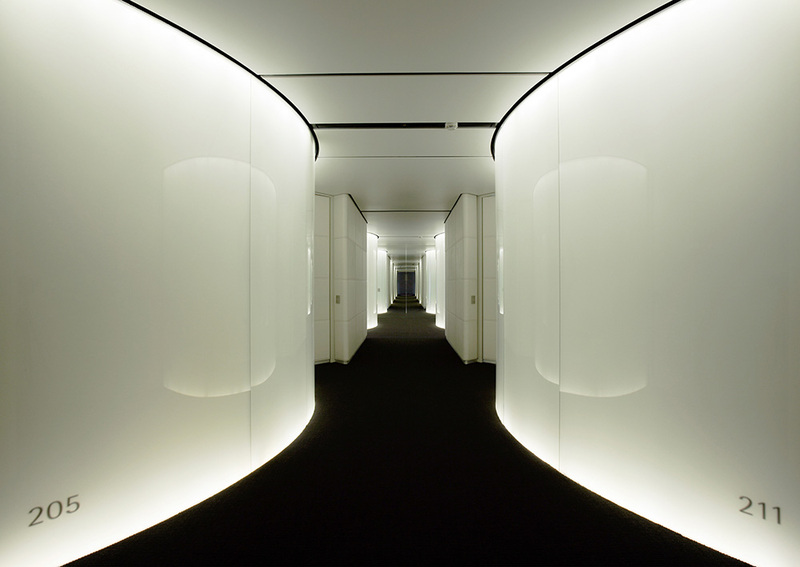 A sequence of top-lit, circular glass drums lines the corridor and punctuates it with a chain of illuminated ellipses. These drums become the central elements that link the corridor with the interior of the rooms. 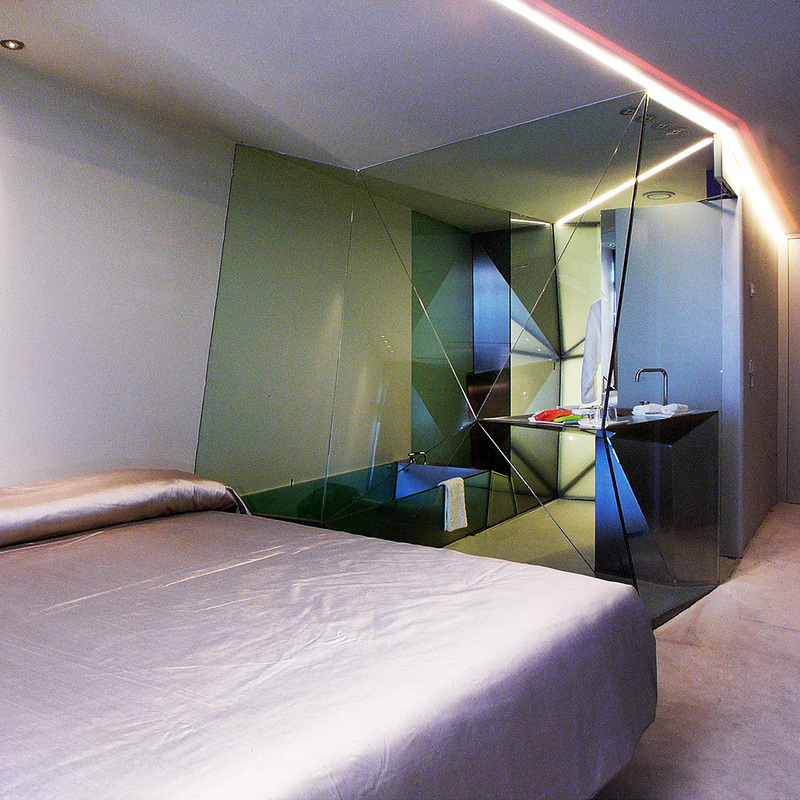 Continuing into the bedrooms, the glass elegantly curves around the integrated shower area, creating a subtle partition. 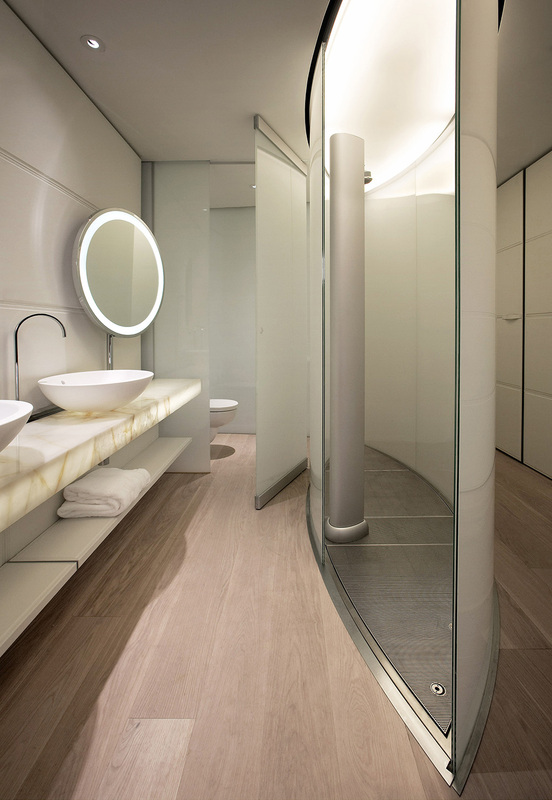 The washbasins sit on a glowing onyx shelf that sweeps out to the full length of the room, forming an elegant connection between the two areas. The shelf embodies the flexibility of this multi-use living area: it is a desk, a wash stand and a dressing table. The design appeals to all the senses and uses Chillida’s natural material palette, with warm cream and brown colours. The leather wall panelling is sumptuous and tactile, further adding to the impression of quality and luxury. Conceived as an ‘urban sanctuary,’ the Foster and Partners’ designed suites will offer a luxurious respite from Madrid’s frenetic bustle. Third floor. Luxury and privacy. David Chipperfield. The third floor, designed by David Chipperfield Architects, aims to distil the generic components of the business hotel into a new but not entirely unfamiliar package. The rooms use a simple yet luxurious reduced palette of materials. Handmade black terracotta tiles cover the full extent of the floor stepping up to form a low level plinth that provides a base for the bed, bench etc. White lacquer storage components are recessed into the walls. 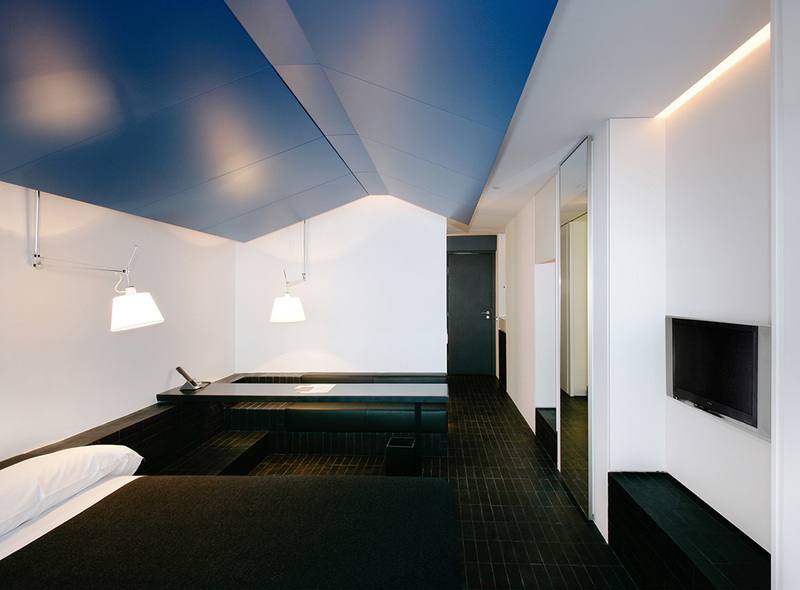 A blue lacquered DM canopy is suspended over the bed. 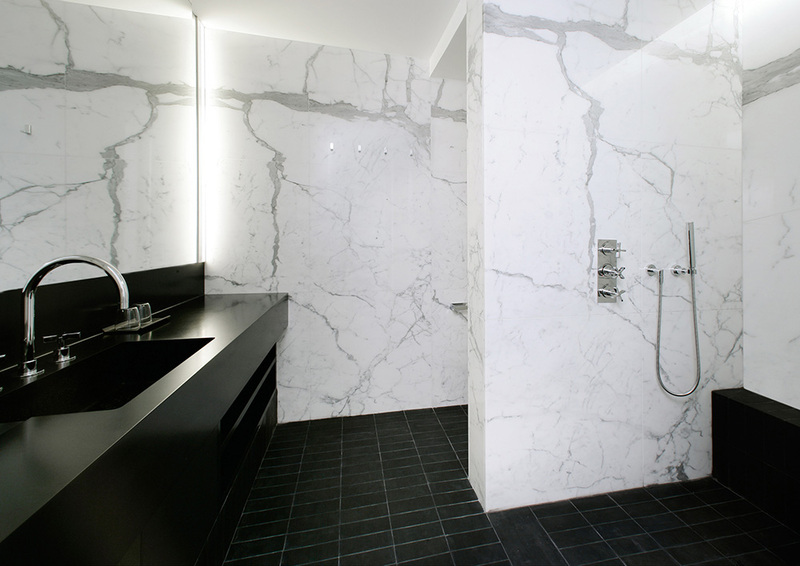 A bathroom is made entirely of white marble with an oversized open shower. Fourth floor. An exercise in geometry. Plasma Studio. ‘Hotels are usually characterized by linear bands of repetitive units with resulting anonymous undifferentiated corridors that contrast with the hotels’ ambition to treat each guest as an individual. 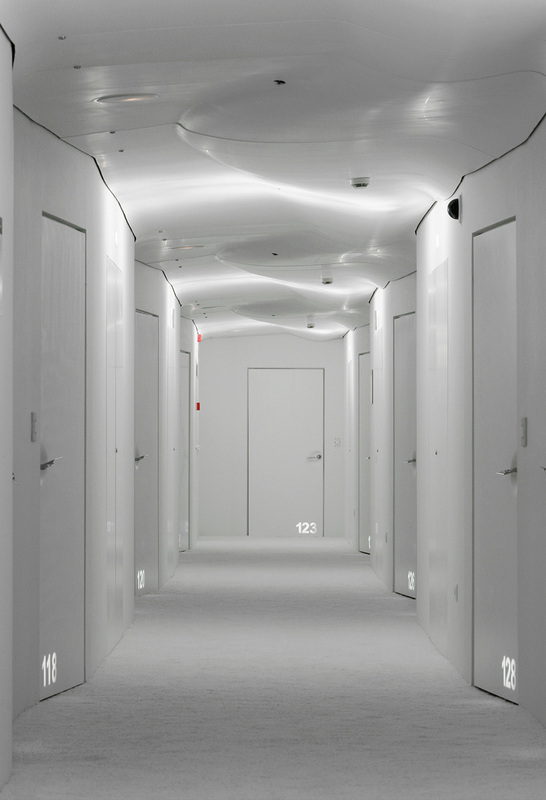 For the design of level 4 of Hotel Puerta Am?rica we used this repetitive rhythm of partition walls, service ducts and entrance doors as a sectional framework from which a differentiation of the corridor skin was devised. In other words the perpendicular partition walls were pulled along their axis, while the entrance doors produced resistance. In addition to this radical geometric formation we introduced a colour gradient as an LED light seam that gradually changes. 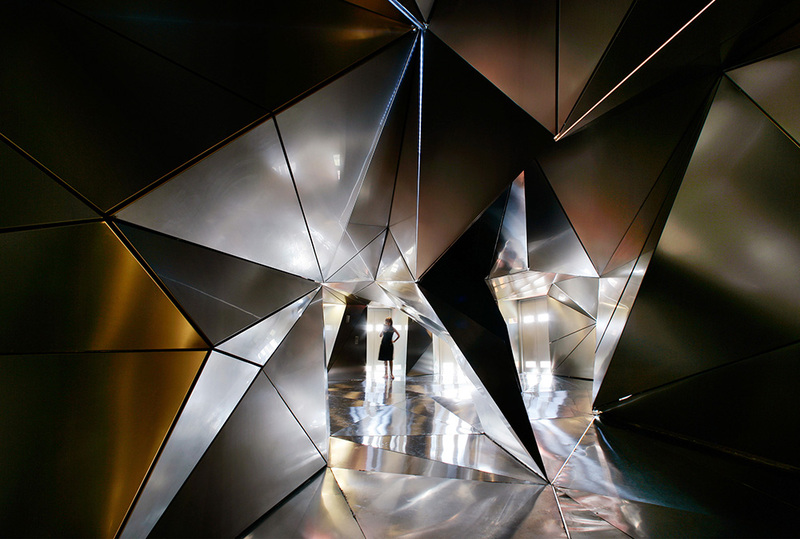 The space of the lobby and the hallway is resolved using large pieces of stainless steel and geometrical shapes reminiscent of a spaceship. The structure seems to want to swoop down towards the guest. The sensation of a fictitious work is reinforced by a play of different coloured lights emanating from LED strips which reflect the light over superfine bars of methacrylate, thus reinforcing the intention of creating a sensorial tour where the only thing that counts is the guest’s intuition. The same steel from the hallway gives shape to the shower, the bathtub, the headboard of the bed and the desk, which unfold one after the other, all arranged along the same wall. It is all one single gigantic piece which flows naturally despite the apparent aggressiveness of its shape. 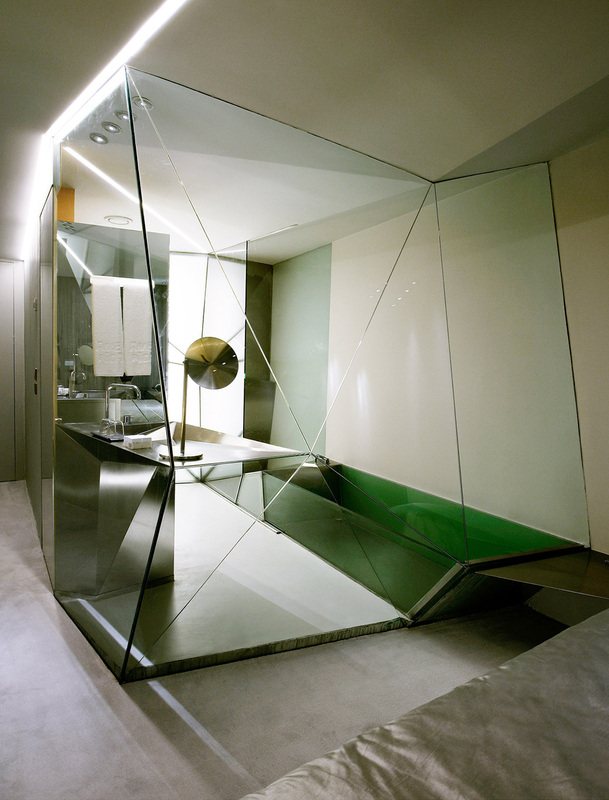 The bathtub is made of glass, and the divider separating the bathroom from the room is also glass and is upheld on its own structure. The floor is made of resin. 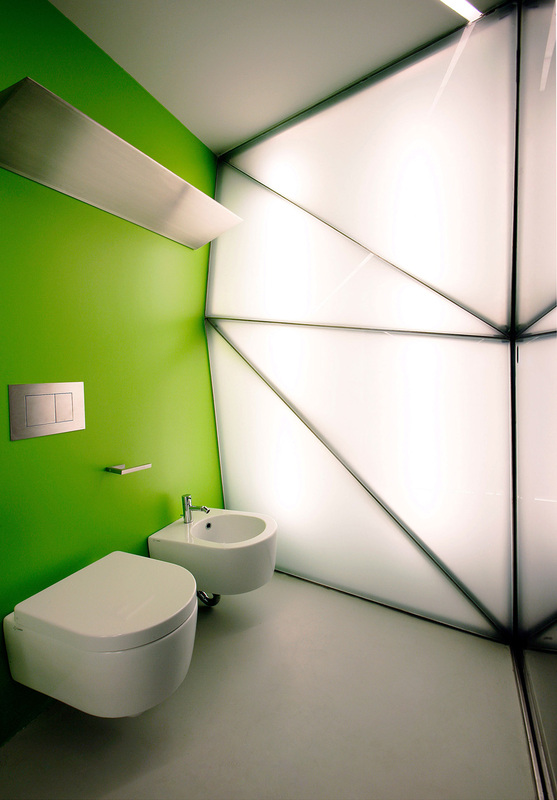 In the toilet there is an attention-grabbing backlit glass panel, and the same solution has been used in the room on the wall hiding the television across from the bed. Fifth floor. Fashion which bedecks an interior. Victorio & Lucchino. Relying on great experience in fashion design, Victorio and Lucchino have dared to make a project of the fifth floor of the Hotel Puerta Am?rica. As the result, they managed to create very private and cosy space that makes guests feel comfortable and welcomed. In the hall, the walls are lacquered in black and the floor is covered in distressed black stone. 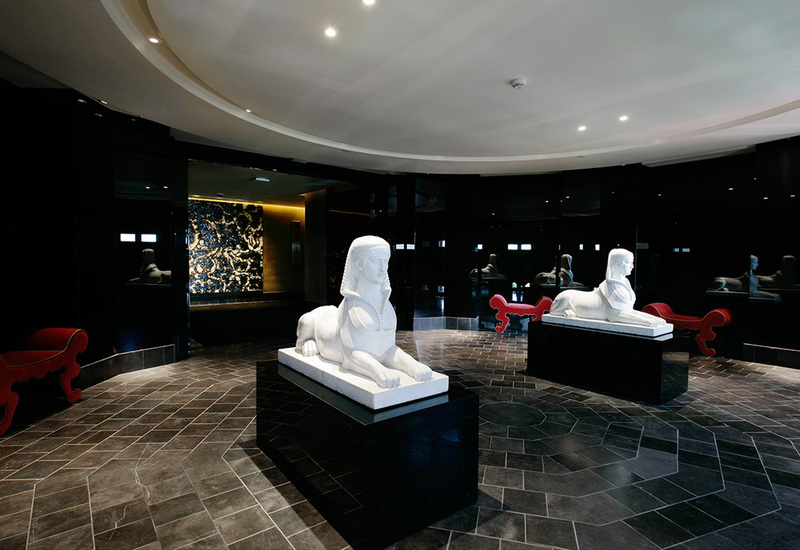 There are two white marble sphinxes from the designers’ personal collection in the middle of the lobby. The hallways are lined with black carpeting which contrasts with the beige velvet on the walls. Gypsum plumes reinforce the Baroque touch in the decoration. The most remarkable thing about the rooms is their uniqueness. Not a single element – neither colours nor placement – is repeated in different rooms. 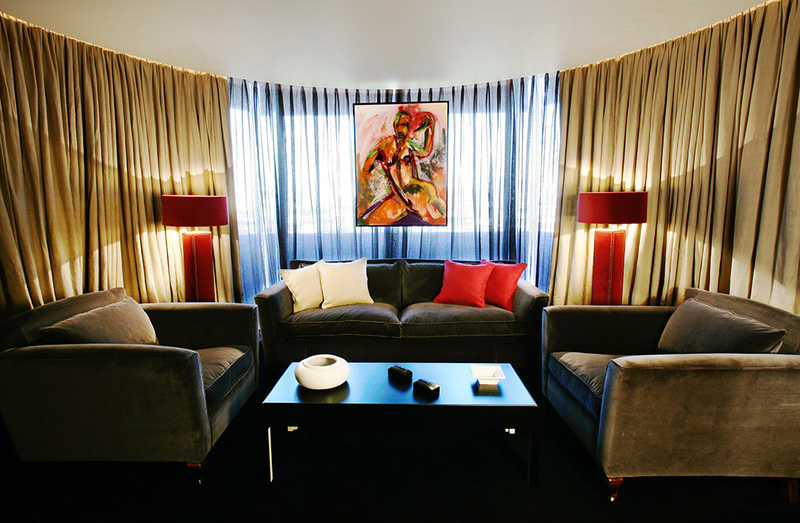 In each room, there is one-of-a-kind work crafted by the artist Sergio Cruz. The authors strove to make the atmosphere ‘luxurious yet comfortable’. Planning the rooms, they tried to stick to a classical layout, with the desk right next to the bed. The black furniture is also designed by Victorio & Lucchino. In the bathroom, comfort and harmony reign among the bathtub and sink and the other pieces, all in ceramic. Finishing touches include red or beige candles, as well as custom-designed ceramic receptacles and pots. Victorio & Lucchino have forgotten no detail, and every single one bears their signature.